Indonesia and its vast expanse of 17.000 islands is a "must-see" world cruising destination that offers a spectacular and memorable cruise. It is one thing to have a pre-planned cruising itinerary but to ensure a highly memorable trip that meets the fine details required when voyaging through a fantastic area such as Raja Ampat, it is important to be aligned with a highly professional team and your contact be someone who knows the waters better than anyone else. In Indonesia, that's Captain Jimmy. The personable director and co-founder of Asia Pacific Superyachts Indonesia, Captain Jimmy Blee, sat down to share his thoughts on how Raja Ampat became an ongoing passion in his life on the sea. Q: Nice to meet with you Captain Jimmy, it is delightful here on the back deck of the luxury charter boat Amandira in Waisai, Raja Ampat. A: Yes, it is and I am happy to share my thoughts of this wonderful part of the world. Raja Ampat is one of the many cruising jewels in Indonesia and it’s very special to me. The area offers so many unique attractions, especially for Superyacht visitors. Q: What makes Raja Ampat so special? A: It is a combination of things. First and foremost, it is the fantastic underwater world and world class diving. We have slowly developed a terrific team of "Top Gun" dive experts that work exceptionally well as onboard dive/guides. We also work hard to match the best guide with the specific vessel’s needs. Raja Ampat has the largest biodiversity of corals on the planet and with this level of coral life, obviously the tropical fish and marine life is incredible wherever you are voyaging in this area. Q: And what are some of the other attractions to Raja Ampat, in addition to the outstanding diving? A: The natural topography and the fantastic people and their unique culture. The above water landscapes in Raja Ampat are breathtaking and, like anywhere in Indonesia the local people are warmly hospitable and friendly. Having developed good and lasting relationships with various people and tribes of Indonesia, we are able to plan special events in hidden locations, unlike any others. Q: APS Indonesia seems to have a very strong service presence here in Raja Ampat and Waisai. How did this come about? A: Yes, we do and all of us at APS Indonesia envision Raja Ampat as the gateway key destination to Indonesian cruising for the next 10 years. In fact, our commitment is so strong to this cruising area we recently designated Raja Ampat as a stand-alone branch of our Indonesian operations. We have three permanent and highly experienced Papuan staff and expert dive/guides directly on hand. These are among the most highly rated guides of the area and have knowledge of every inch of the best dive locations in the area. Our prime objective for our client boats is to ensure the Captains have as much support and care as we can give them. As we well know, their jobs are already demanding and we can relieve some of these demands with an on board guide, while at the same time show the vessel’s owner and guests the best Indonesia has to offer. Company wise – in addition to or Raja Ampat offices we have a storage and collection office in Sorong; and we and plan on opening an office in Waisai within the next few months. Q: That’s quite a commitment. Can you boil your service down for us? A: Our motto is "Personalized service from the most experienced team in Papua"
Q: Excuse my geography, "Papua"? A: Raja Ampat is a specific area in the greater Indonesian province of Papua. The name Papua itself tends to sometimes confuse people who when hearing the name, relate to Papua New Guinea [PNG], which is a separate country. The Indonesian province of Papua was renamed on January 1st 2002 from its previous name Irian Jaya. This is not yet widely recognised and causes some confusion, which we aim to help clarify. 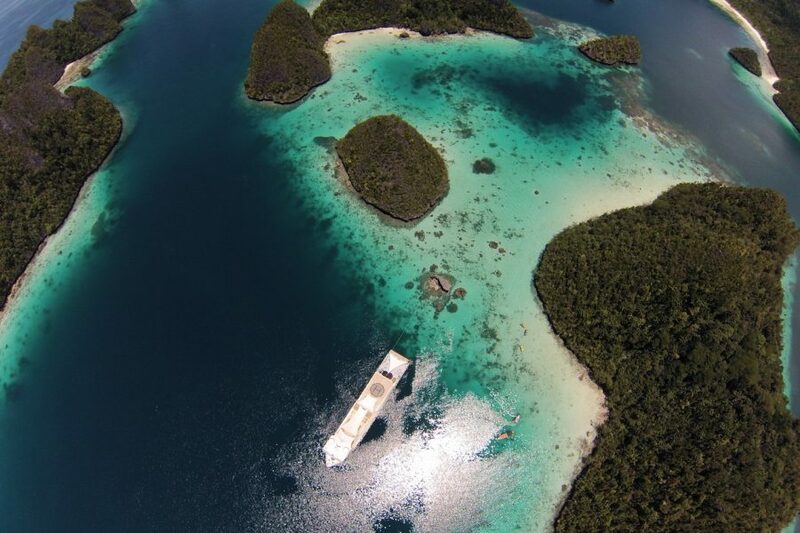 Q: On another tact, for Superyacht Captains and Owners planning to bring their yachts to Raja Ampat, what does APS Raja Ampat have over its competitors that makes it more attractive to use APS services? A: Good question. I first brought my own charter boat to the Raja Ampat cruising area in 2001 and seeing the unbelievable place that it was, have since that day, been running and operating boats in this area. As you can imagine in those days the area was very primitive and had no infrastructure or facility to service superyachts in any form. I brought the good ship Senses to the Raja Ampat in 2005, in those days owned by a wonderful New Zealand man, Doug Myers. To this day I am confident in stating this was the first ever superyacht to ply these waters. I can assure you the challenges to make the one month trip the success it was, were considerable. Since these early days all of us under the APS Indonesia banner have steadily built, established and strengthened networks and local support comprised of individuals who are trustworthy and work well with us. To this day our local support and personalized services we can provide for our Captains and Owners is second to none. Q: Well, thank you for sharing some of your knowledge of Raja Ampat, Captain Jimmy. Any last thoughts? A: It’s been my pleasure to share these thoughts and I would like to personally invite Captains and Owners to contact me directly about the wonders of Raja Ampat and we are looking forward to seeing more superyachts visiting this living paradise.